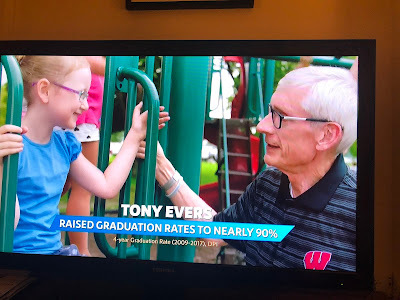 I don't see the poll numbers on the law school's website, but WTMJ is reporting that Evers has picked up a point to pull into a tie, Kaul is closing the gap with Schimel and Baldwin has a commanding lead. Baldwin has a calming, commanding presence; Vukmir is getting crushed by her anti-health care voting record and devastating ads with personal testimonials from real people about what losing their health care and prescription medicine coverages really means. Bottom line: Turnout, as always, will carry the day and Democrats must over-perform to overcome GOP ad spending superiority, voter suppression, gerrymandering advantages, registration record-scrubbing, etc. This is more garbage - I am really surprises that you apparently tbink that over 10% of Baldwin's supporters are voting Walker. Wisconsin will never escape GOP rule if we unquestionably accept this nonsense. The state is highly divided and polarized. There is no reason to believe that Baldwin/Walker voters are going to swing tbis race. And since we know that Wisconsin voter databases and perhaps even election systems, no one really knows for sure and if they do they ain't talkin', any pollster that called 2016 accurately should be suspect now. It's simple - those that accurately predict elections that can demostrably be shown to have been hacked, cannot be trusted now. To Anon 2:11 p.m. Anti-Vukmir, sore-losing Nicholson voters. Not 10%. There are very few people that will vote for Progressive self-described lesbian instead of a republican that will tow that g o p line. Franklin's polling doesn't make sense if you accept there were shenanigans in the 2016 election. How does a pollster get it right when there were problems in the system that everyone agrees existed to some degree, but that no one will specifically talk to. We'll see, but Baldwin winning by more than 10 and Walker winning by three or more is pretty clear evidence of fraud. Marquette law pole appears to have some inside information, as their polling is and outlier. If Walker wins by 3 and Baldwin wins by more than 10, are you going to believe it was so the up-and-up then?